Tummy tuck aims to restore a more youthful tummy profile which may have been affected by ageing, pregnancy and fluctuating weight that all take their toll on your shape, especially around the waist and hips. Skin laxity and extra fat contribute to folds on the lower part of the tummy. This can cause lack of confidence with wearing clothes or swimwear. The tummy feels heavy and sometimes there can be soreness under the skin folds. Tummy tuck is a plastic surgical procedure which removes excess skin folds with underlying fat from around the lower abdomen between the navel and the pants line. Skin from the upper abdomen is stretched downwards to replace the removed skin and the navel is stitched into position. This greatly improves the abdominal contour and will make you look slimmer in clothes. Although some skin and fat are removed from the tummy, abdominoplasty is not designed to reduce your weight; typically the quantity of tissue removed is less than a kilogram. This operation is appropriate for people who have been previously overweight - having returned to a healthier weight, folds of stretched skin and fat remain and these are removed by abdominoplasty. If your body mass index is 29 or more, abdominoplasty is unlikely to be appropriate and it should preferably be less than 25. Therefore, abdominoplasty is surgery to restore the body contour after weightloss. You may previously have had gastric operations to help you lose weight. This does not ordinarily prevent you from having abdominoplasty. Look at the body mass index table (link on right of page). If you have a lot of stretchmarks below the navel, these are taken away by tummy-tuck. Stretchmarks which are above the level will not be removed but these will be transferred to a lower position on the tummy. Does the surgery require a general anaesthetic or hospitalisation? Tummy tuck surgery is done under general anaesthetic, commonly as a day case or occasionally as an overnight procedure. Tummy tuck normally takes approximately 2 hours to perform depending on the complexity of the surgery. Moderate pain / discomfort is expected for 3 – 5 days. Patients can go back to their normal daily activities after 2 weeks, but avoid strenuous exercise / activity for 6 weeks. The tummy will feel tight after surgery and you should avoid stretching fully in the first few weeks as this could disrupt the wound. It will be necessary to wear a support garment for the first 6 weeks, day and night and the second 6 weeks during the day. The majority of swelling will resolve in 4-6 weeks but it will take up to 3 months to return to normal. There is a scar which passes across the lower part of the tummy and this is positioned in the pants-line. Another small scar is made around the navel. Typically, these scars are very subtle once they have fully matured although this process of maturation takes at least 6 months. It is recommended to wear micropore tape on these scars for 3 months in order to help the flattening and maturing process. Does it treat a caesarean section scar? 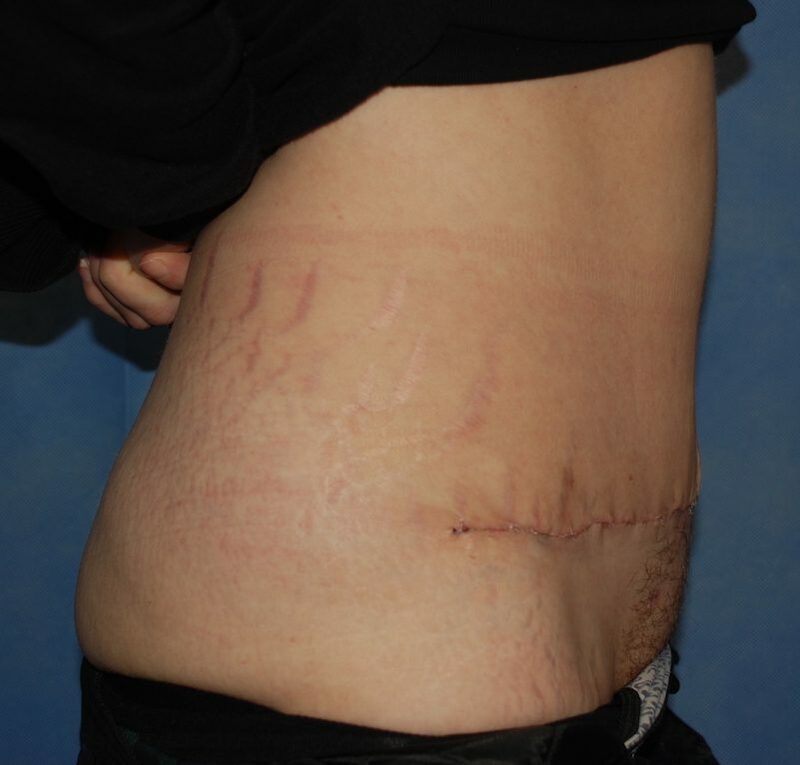 If there is a caesarean section scar, the tummy tuck surgery uses this old scar and makes is longer to each side. If there is a dip or a bulge adjacent to your aesarean scar, this is typically addressed by tummy-tuck. There are always risks associated with all operations; abdominoplasty surgery is a safe procedure when performed by a fully qualified and trained Plastic Surgeon in reputable hospitals. The following problems can occur - bleeding, infection, delayed wound healing, fluid collection under the skin (seroma). Each of these risks may extra visits to outpatients or even revision surgery. Other risks that may occur are, poor scarring – hypertrophic or keloid. Rarely, the blood supply to the navel or larger areas of the abdominal skin can fail. Up to 5% of patients will require a further local anaesthetic procedure to tidy secondary folds ('dog-ears') at the hips which can result from refashioning large areas of skin. All patients will experience numbness over the abdominal skin which slowly recovers over many months but rarely returns to normal. Precautions are taken to prevent blood clots - DVT and PE and these are rare but potentially dangerous conditions which can result from any type of surgery. Will the abdominal muscles need to be tightened at the time of my Tummy Tuck? Stretching of the muscles ('six-pack' muscles) in the abdomen occurs during pregnancy and also with ageing or significant weight gain. This results in the widening of the youthful waistline. Therefore, at the time of your tummy tuck, the muscles will be tightened, if necessary. Am I the ideal patient for Tummy Tuck? If you would like to improve your body shape because of skin laxity and excess fat in your lower abdomen, which does not reduce with good diet and exercise this procedure will help you. You should not have any serious medical conditions and not be significantly overweight. Can Tummy Tuck be combined with any other procedure? Yes. Commonly liposuction can be performed at the time of an Tummy Tuck especially around the hips, outer thighs or inner thighs to achieve an aesthetically balanced shape. Abdominal hernias can also be repaired at the same surgery. Tummy tuck can also be combined with Breast Surgery such as implants, uplift, or reduction and body lift surgery. What is possible and safe for you will depend on your goals and your individual circumstances. Body mass index chart indicates suitable body weight : height ratio for tummy tuck and other body contouring surgery. If you are very overweight, you can calculate a healthy target weight by finding your height, following the row into the green zone or the lower edge of the yellow zone and then follow the column up or down to find the corresponding weight. 3 weeks after surgery - a flatter, more defined abdomen. Surgical scar well healed and pink colour will fade as it matures over 6 months. Absorbable buried stitches used.